Silver Prices - Silver Prices - Silver Stocks: Focus and Concentrate! Silver Stocks: Focus and Concentrate! Silver spent the day in the firing line where another loss was registered of 8.89% during the trading session lowering the price to $16.79 at the close. Now isn't the time to feel sorry for yourself, now is the time to focus and concentrate on those silver stocks that you wanted to own but did not buy because they where too expensive. A number of our readers have berated us for not taking part in the recent run up in stock prices and buying more posistions as the euphoria gathered steam. To us the stock prices and silver itself were overbought and so our 'opportunity cash' stayed on the sidelines. Well the correction has arrived with a bang. The first thing to do is stop looking at what might have been and look for the opportunities that a correction of this magnitude can offer. 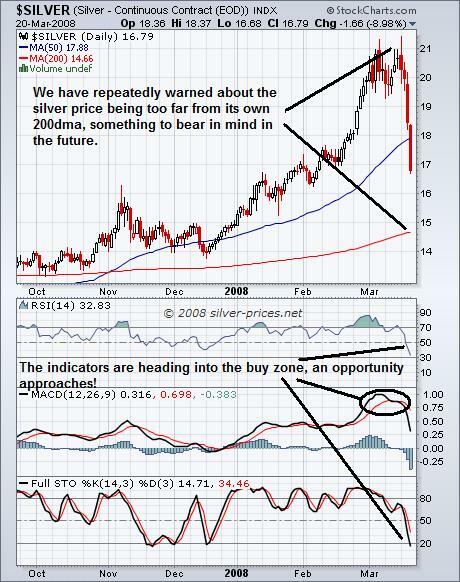 We have a number of silver stocks on the watch list that are rapidly approaching our 'buy' zone. The same goes for you, keep a close eye on your favourite silver stocks because the window of opportunity that is approaching will not be open for very long. The big picture has not changed and the bull market is not over just because it managed to beat an historical high. A rapid run up can fall victim to a rapid correction and that is what we are witnessing. However, what we need to do now is be patient and observe the action, we need to let this pull back run its course and then pick our shots as some stocks will be oversold far more than others. This is something we are working on right now and it could be as early as next week that we spot the trade. Our strategy remains pretty much the same, we are holding a core position in this bull market as the unexpected can happen at any time as evidenced by the Bear Stearns situation. If you thought that was a one off you are dreaming. The world of high flying investment bankers is infested by Muppets (all due respect to Kermit). The other part of our strategy is to look for short term trades, do remember that a trade generating a profit of 30% and executed three times a year meets our investment criteria of doubling our capital in twelve months. The other thing is not to be lazy about investment. Do try to write down why you are buying any stock and how you expect it to perform over a given time frame. Also decide on an exit strategy that suits you, not your buddies, before you put your hard earned cash on the table. Have a really great Easter and come back refreshed because the pace is quickening and you will need to be alert, as 2008 will finish a lot higher than it started. If you would like to follow our adventures in the silver sector and receive our frequently published and soon to be legendary free newsletter then please click this link. Wish I had listened. I did for a while but then got caught up in the whole short squeeze story around 19-20 dollars. The had 60K worth of silver and have obviously taken a pretty big hit this week. Still I DID not sell which surely means I am not done yet. In fact, yes, i have taken a loss but am prepared to buy another 40K when necessary at the bottom. So a big thanks to you guys. Scott, Thanks for the input, once the smoke clears we should be able to get a better handle on it. A good way to follow the distance of the silver price from his 200dma is the daily updated chart on . Thanks for your interesting silver blog. Keep up the good work.